Gargoyle decorating the Cathedral de Notre Dame (1163- 1345) in Paris, France. Gargoyle mooning another building, Frieburg, GER, photographed by macg.stiegler on 4/9/2004, image sourced here. Mooning is the act of displaying one's bare buttocks by lowering the backside of one's trousers and underpants without exposing the front side, bending forward. It is generally considered a rude and disrespectful or insulting act, but is much less offensive than flashing. It is often performed as a form of protest or simply for fun. Mooning is sometimes performed from a moving vehicle. The act of placing one's buttocks against glass while mooning (for example, a car window) is known as a pressed ham. Formerly, mooning was slang for wandering idly and romantically pining. 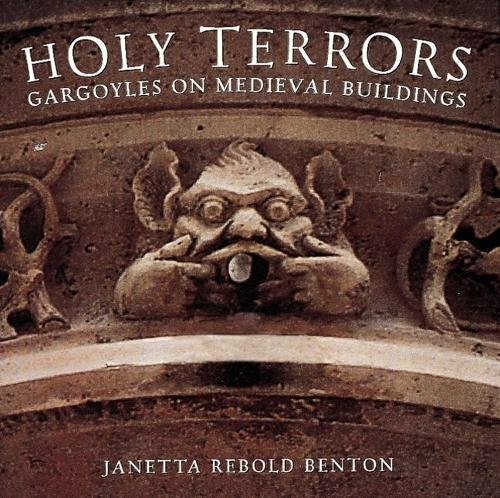 Gargoyles in the strict plumbing sense of the word (see Etymology) have been around since the time of the Ancient Greeks or before. They became very popular on architecture in Medieval times, with a resurgence in the Victorian era, and to some extent more recently. Other periods have none or few carved ones. Saxon churches (a little before Medieval times) that I've seen usually have troughs but whether these are original or later additions is hard to say. Large buildings of the Elizabethan period (a little after Medieval times) did use channels or troughs but I've never seen or heard of carved ones. Their first usage in the last thousand years or more seems to have been in the early 1200's as channels or tubes to shed rainwater from buildings, to keep the rainwater off the buildings themselves and away from the foundations. Strong evidence for this purely plumbing interpretation is that initially most were made of wood, some made of the more expensive stone, and were generally undecorated. As time progressed, more stone ones appeared as did lining some with lead and decoration in the form of carvings of people or animals or grotesque representations of these (grotesque in the sense of being extravagantly formed, bizarre, ludicrous, absurd, fantastic and also in the sense of being ugly and frightening). Often these carvings are so imaginative as to bear little or no resemblance to any conventional creature and are the products of fertile imaginations and skilled hands. They are common on the more expensive buildings from medieval times, particularly cathedrals and churches, and particularly France, and particularly the Gothic style. A few plain ones survive on non-religious buildings like the odd castle but rarely compared with religious buildings. Presumably, as today, the average wage did not run as far as paying for ornate stone guttering for your own humble dwelling.